James Calado and Dean Stoneman were in winning form once again in the Formula Renault UK Championship, this time at Snetterton. BRDC Superstar James beat Rising Star Dean Smith by over a second and a half for Fortec Motorsport with Rising Star Oliver Webb making it an all BRDC young member podium in third. Just behind Oliver was Lewis Williamson in fourth while Superstar Dean Stoneman was just behind him in fifth. Race two also saw a Superstar in winning ways again but this time in the form of Dean Stoneman, just holding off the other Dean on the track, Dean Smith, who took his second runner-up spot of the weekend. Race one winner James Calado also kept his strong form going as he took third place. Oliver Webb finished race two in fifth place while Lewis Williamson was a non-finisher as he ran out of road trying to break through the field at the beginning of the race. Jonny Adam was back in action with three top ten finishes in the HiQ MSA British Touring Car Championship at Snetterton over the weekend following the summer break. The BRDC Superstar finished race one just off the podium in fourth place having vied for third place until the field were bunched up in the dying laps under yellow flag conditions. This saw Jonny lose third place to Paul O’Neill, leaving Jonny in fourth. Fellow Superstar Andrew Jordan finished race one in 12th. Race two saw Jonny in strong contention once again for a possible podium, but his BMW 320si suffered tyre problems leaving him to hang on for sixth place at the end of the race, while Andrew saw a repeat of race one with a second 12th place finish of the day. In race three Andrew Jordan was the top Superstar as he finished just off the podium in fourth. Jonny Adam had initially grabbed third place but his luck seemed to be going against him as he first slid off track after hitting oil and then he spun to put him back to 15th. Jonny did manage to claw his way back though to ninth, meaning three points finishes for the 24-year-old for the first time in his BTCC career. Andy Meyrick was out in Portugal for the Algarve 1000km at the weekend, but did not finish the race. There were double podiums for the Rising Star duo of James Sutton and Tim Bridgman in the Porsche Carrera Cup GB races at Snetterton yesterday. In race one James Sutton took second place ahead of the third placed Tim Bridgman before the pair switched results for the second race of the day. Also on track was fellow Rising Star Tom Bradshaw who finished in ninth for race one and sixth in race two. 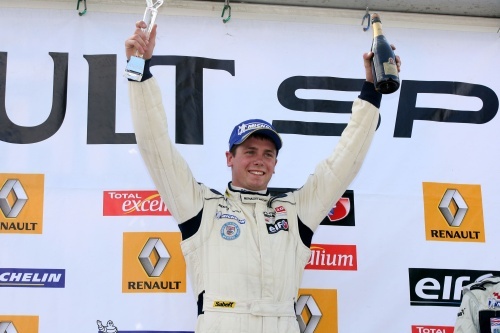 Jon Lancaster has claimed his first victory in Formula Renault 3.5 in Portimao, Portugal at the weekend. The BRDC Rising Star held off numerous attempts on his lead throughout the race, which was shortened from 44 minutes plus a lap to 35 minutes plus a lap due to the extreme heat. The second race of the weekend saw Jon fail to finish however as he spun before after crashing with Anton Nebylitsky. Superstar Oliver Turvey was a non finisher in the first race having become entangled with Daniil Move and Pasqual DiSabatino. In race two Olive finished in sixth. Rising Star Greg Mansell finished in 11th place in race one and 13th in race two while British Formula 3 regular Daniel Ricciardo was a non finisher in the first race and 15th in the second. Alex MacDowall took his third win of the season in the ELF Renault Clio Cup at Snetterton in a rain-shortened first race on Saturday. The 18-year-old BRDC Rising Star pulled into the lead after a safety car period and he managed to keep rival championship Phil Glew at bay as the conditions worsened. In Sunday’s second race, Alex was lying second until he went grasstracking and rejoined in fourth, the position he finished in. Alexander Sims recorded two top six finishes in the Formula 3 Euro Series at Oschersleben last weekend. The BRDC Superstar finished race one in fifth place and was one place higher for the second race of the weekend at the German circuit for Mücke Motorsport. Rising Star Brendon Hartley was 21st in race one and 17th in race two. Rising Star Martin Plowman finished the Indy Lights race at the Kentucky Speedway in ninth place. Sarah Moore took to Snetterton circuit for her first race as a BRDC Rising Star at the weekend and came away with a fourth and fifth place in the Ginetta Junior Championship.